Halloween sure is a scary holiday – and not just because of the ghosts and goblins seen traipsing around your neighborhood. It’s a scary holiday because of the terrifying treats we hand out to all the children. Now I know what you are thinking – it’s only one day, candy is not so bad, or they deserve it after all that walking. While that is true to an extent – hey, we all like to indulge a little – it is more important to remember that you will have leftover candy hanging around your house WAY past the freaky festivities. So we went to the experts. 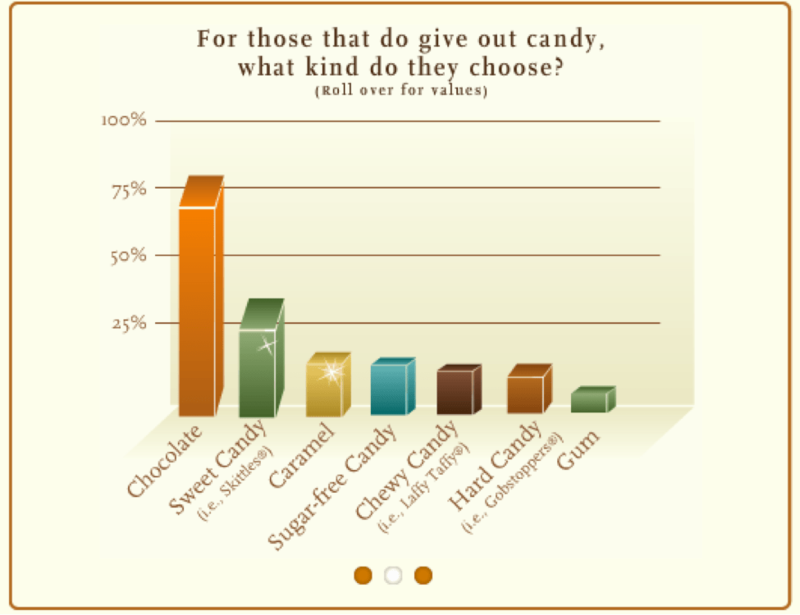 What IS the best choice for Halloween candy? 79% of all dentists surveyed chose chocolate as the sweetest treat for your teeth. Since it melts faster than hard candy, and doesn’t get stubbornly stuck in between teeth like sticky candy, chocolate is the best choice to make sure you don’t wake up to tummy aches AND tooth aches.